You may only know him for playing Denzil in Only Fools and Horses and Horse in The Full Monty but Paul Barber has been acting since his first part in the musical Hair in 1970 but Paul Barber was a mixed-race face that was so part of the British background we often forgot he was part of our mixed-race history. As if to remind us he was there Paul Barber's Foster Kid is an account of the actors life growing up in the British care system. While it is a grim tale of the failings of social services to keep a family together and the short comings of some foster parents, who only did it for the money, Paul manages to tell his story with the sort of humour only a true scouser can do. You will cry at the abuse but you will also laugh at his small victories and in the end you will smile with Paul because against all the odds, he pulled himself up and carved a career that has lasted decades. This is a great read for those who have either been or are still in the care system because Paul shows us that there can be life after care and a good life at that. 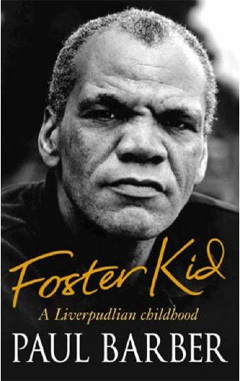 Foster Kid by Paul Barber is available to buy now.